TRI-STATE CONVENTION ATTENDEE REGISTRATION PACKETS AVAILABLE! Click here for a PDF of the attendee packet. Click here to register for the Crematory Operator Certification Course. TRI-STATE CONVENTION EXHIBITOR PACKETS AVAILABLE! Click here for the exhibitor packet. Funeral Service Foundation, Youth and Funeral Video, Youth and Funerals e-book. VA Burial Flag Request Form now availabe in Documents and Downloads of Members Only secion. Music License now available in Documents and Downloads of Members Only section. The U.S. Department of Veterans Affairs (VA) program to reimburse for the purchase of a casket or urn used to inter a deceased, eligible, Unclaimed Veteran in a VA National Cemetery, is in place. The program allows for the reimbursement to any individual or entity, has standards for the casket or urn purchased, and by law requires that the Veteran died on or after January 10, 2014. For eligible Veterans who died on or after January 10, 2014 and were interred in a VA national cemetery prior to May 13, 2015 there are special instructions for applying for the reimbursement. To learn more about the program and how to receive reimbursement, please reference the fact sheets listed below. Burial in a national cemetery is open to all members of the armed forces, and Veterans who have met minimum active duty service requirements, and were discharged under conditions other than dishonorable. Their spouse, widow, or widower, minor children, and, under certain conditions, unmarried adult children with disabilities, may also be eligible for burial. Eligible spouses and children may be buried even if they predecease the Veteran. Members of the reserve components of the armed forces who die while on active duty or who die while on training duty, or were eligible for retired pay, may also be eligible for burial. Darrel W. Girardier, was born June 14, 1926 in Morse Mill, MO. He was the son of John F. Girardier and Bertha Whitworth Girardier. 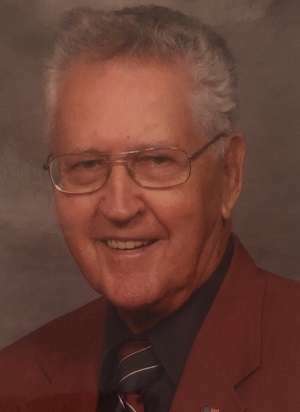 He passed on April 18, 2019 at St. Joe Manor in Bonne Terre, MO at the age of 92. He is survived by his two daughters, Janice (Richard) Rogers of Arlington, TX and Mary Jo (Kenny) Leftridge of Bonne Terre, MO. Six grandchildren, Brenda (Chad) Allen of Bonne Terre, MO, Tracey (David) Oder of Bonne Terre, MO, Julee (Ed) Schnieders of Dallas, TX, Sara (Jeff) Phillips of Henderson, NV, Darrel (Amy) Girardier of Franklin, TN and Robert (Emily) Girardier of Chesapeake, VA and 20 great grandchildren. A daughter in law, Marty Girardier of Chesapeake, VA and a sister Carol (Elden) Lee of Dittmer, MO, sisters-in-law Jean Hobson and Beverly Agers of DeSoto and a brother-in-law Jim Woolsey of North Branch, MI. Special friends Todd and Daniel Mahn of Festus, MO and Cliff Copeland of DeSoto. He was preceded in death by his beloved wife of 56 years, Norma Lee (nee Hobson) Girardier, son John F. Girardier, and sisters Wanda Toulouse, Oleta Gibbons and Helen Girardier. Darrel worked for Missouri Pacific Railroad and Retired from the United States Post Office of which he was a letter carrier in DeSoto and a Postmaster in Winfield, MO. Darrel also worked as a Funeral Director for Mahn Funeral Home. He served in the Army in World War II, was a Deacon and member of the First Baptist Church DeSoto, he belonged to the Gideons and also to the DeSoto Masonic Lodge #119 for 63 years-Past Master 1963 and Past District Deputy Grand Master. He had been involved in Boy Scouts since 1963 and was a Scout Master of Troop 543 for 15 years, was awarded the Silver Beaver Award and the Vigil of Honor in the Order of the Arrow. Officiating the service will be Rev. Jim Owens and Todd Mahn. In lieu of flowers you may make Memorials to Gideons International. The James O’Donnell Funeral Home of Hannibal, MO is seeking the talents of a skilled funeral director and embalmer to join our team. The James O’Donnell Funeral Home is a 5th generation family owned funeral home located in historic Hannibal, MO on the Mississippi River. Applicant must be a licensed embalmer and funeral director. Making funeral arrangements, embalming and helping our families plan the most memorable experiences are essential requirements and expectations of this position. Competitive salary, health insurance, 40l K and paid time off are all included benefits. For more information please contact Jim O’Donnell at 573-221-8188 or email us at jimmyo@jamesodonnellfuneralhome.com. For more information about our firm visit www.jamesodonnellfunerahome.com or visit us on face book. Posted 3/6/19: Employment Opportunity: We are a family owned & operated Missouri funeral home & crematory, located in Eastern Jackson County, looking for a funeral director and/or funeral director/embalmer to join our family friendly staff. We have multiple locations with shared responsibility. Applicant must be interested in serving others in their time of need, not just receiving a paycheck. Family obligations are understood & church involvement is encouraged. No middle of the night pick-ups or embalming are required. We have a rotating weekend schedule, with every third weekend (Saturday & Sunday) guaranteed off. Wages & benefits will be based on experience & ability. If you are interested in this position, you may send your resume to royer@royerfuneralhome.com or call us at 816-690-4441 for more information. Posted 2/27/19: Ledford Family Funeral Homes has two locations East of Kansas City, Missouri. Ralph O. Jones Funeral Home in Odessa, MO and Walker-Nadler-Fuller Funeral Home in Lexington, MO. We are looking for the right person that is a licensed Funeral Director and Embalmer. We offer excellent pay, benefits, paid time off, retirement plan, and a FAIR on-call week and weekend schedule. Ledford Family Funeral Homes will currently serve around 180 families a year. Our locations are 20 mi. east of Kansas City, you have two great places to raise a family, live in small towns and enjoy all of the convenience the metropolitan areas have to offer without having to drive far. If you feel you are the right candidate for our family please send your resume to jaustin.ledford@gmail.com. Are you looking to grow your funeral career? Newcomer Funeral Home is a large family owned, multi-location funeral home looking for a motivated Funeral Director to join our St. Louis chapel (located in St. Peters). This position will oversee daily activities, meet with families to provide the highest quality services and products to satisfy the needs of any client family and maintain a positive employee relations atmosphere. Candidates must be a Licensed Funeral Director in the State of Missouri or the ability to reciprocate, have a clean driving record and proficient with computer programs. Competitive wages and benefits. Join our team and become part of a growing, progressive funeral home. Copyright© 2011 Missouri Funeral Directors & Embalmers Association All Rights Reserved.